One and a half weeks of preschool left until summer break. Life feels full in many ways and moving faster than I can keep up. I’ve resolved to spend as much time at home this summer as possible, skipping any lists and just enjoying our time together with a small footprint that involves the backyard, swimming, walks around the neighborhood and trips to the park as much as possible. I need a deep breath, so I’m headed back to the August Break-style for a bit. Pictures and words, nothing too major, nothing too set in stone. Just wanted to give you a heads up in case the switch in style throws you for a loop. If anyone else wants to join me, please feel free to share a link! I would love to take a break, I really need it, but it seems there won’t be any until July, *sigh*. We will take it easy. yum! and … i need a break, too. 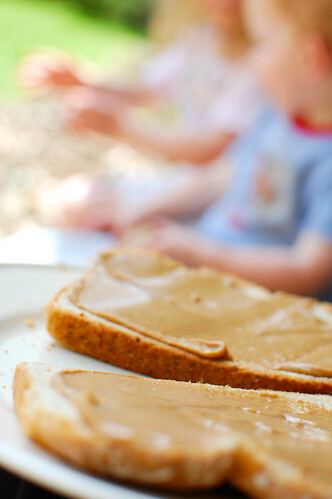 I love smooth peanut butter on toast, yummy! I’m enjoying looking through your lovely blog. I found you through BlueBirdBaby and I am so glad I did!